Summary: I am in the midst of a conundrum. But her BFFAA, Andrew, has started acting weird around her, and a new boyfriend has her friend Caitlin ditching her every chance she gets. When Viola's roommates from Prefect Academy show up for a visit, she starts to wonder—is Brooklyn where she wants to stay? 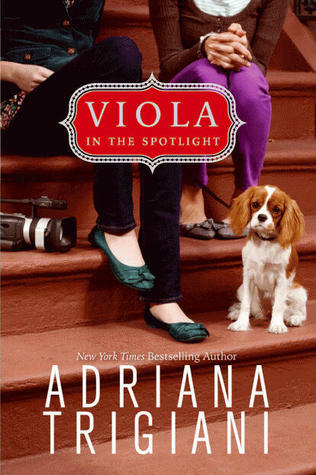 When a tragic event shakes everyone's world, Viola realizes it's not where she belongs that matters—it's who she's with that really counts. My Thoughts: I'm not going to say too much about this one. I thought it was ok, but wasn't a favorite. I read the first one and liked it well enough but it also wasn't a favorite. We are back with Viola and she is finally back home. She's away from boarding school, back with her best friend, her best guy friend, and her parents. She always comes home to find out her family has people staying in her guest house. A father and his teenage son. Does this mean Viola will get a new boyfriend? Nope.. But someone else will! I liked Andrew even more in this book. He finally takes some chances and expresses his feelings for Viola. Was this good? Yes, and No. It didn't turn out like I wanted it too and that bugged me. This is another installment in the Viola series and I'll probably read the next one but I most likely won't love it either. Overall: LIked it, just didn't like it much more than average. Cover: Like it! At first I thought it was a girl and a guy on the cover, but I'm pretty sure its two girls. LOL. I'm surprised this is a series. If I see it I'll probably pick it up. Thanks for the review. I read the first one and thought it was just OK too. I might actually try to give this pone a read, we'll see. I hate when I don't really care for the first book in a series and try the second one only to find out it didn't really make any gains in the like department. This doesnt really seem like my type of book, but glad you thought it was okay enough to finish.